Get Mazaika + Photo Jumble + Click 2 Crop and save $ 35! Buy Mazaika Imaging Suite for $ 84.95 only! Mazaika — photo mosaic program for Windows and macOS! Make your own photo mosaic fast, easy, and professional! Mosaic is an image assembled from small pieces of some material. In a photo mosaic, these pieces are small images by itself. When you look at a photo mosaic from a distance, you see one big image, but as you move close, you understand that it's not just a single, large picture but rather a collection of small, separate images. If you have ever seen these photo mosaics on magazine covers, posters, billboards or at art galleries then you probably already have seen images that were made with Mazaika software. Our software is used by a number of professional and amateur artists and designers all around the world. Mazaika helps them to create eye-catching images. A tiny part of their creations is displayed at our Mazaika Users Gallery. 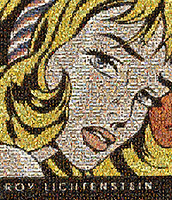 And don't forget to see Gallery page with photo mosaics made by Mazaika.com team. Many companies that sell custom designed photo mosaic posters use Mazaika software. Our programs guarantee the highest possible quality of the result. Artist and designers select Mazaika because of its stability, speed and complete control over the mosaic process. Mazaika is the ONLY photo mosaic program that allows manual changes to every single tile in the finished mosaic. If you don't like an image, substitute it with another matching candidate image! And even more! You might insert custom images as a sort of personal signature, or as a hidden picture riddle (as in a Where are they? puzzle book). Or you might need to make sure that a particularly well-liked image is not passed over as a tile; for example, that Uncle Ernie appears somewhere in your final mosaic. Try our free trial version and see how great your photos look when assembled in photo mosaic of your own design! Using Mazaika you can make professional looking mosaic pictures from almost any kind and type of image files. You can use even simple icon files (at size 32x32 pixels) to create very impressive mosaic pictures. If you have a digital camera, you can use your own pictures as tiles. Note that even in the trial version of Mazaika you have no limit on the image database size and you could use as many of your own custom picture tiles as you want - or rather, as you have :-). If you're short on image files - you can download some of our image collections (for instance, about 3500 lp/cd covers or windows icon collection). Also, we have placed a part of our postcard collection that we have used for mosaic creation. There are 700+ vintage Soviet New Year postcards here. Mazaika is Try-Before-Buy Software. You can see its technical specification and download a free trial version. Several short explanatory videos will help you to start. An extended context help system will answer your questions while you are working. And if you will need any more assistance please don't hesitate to ask us. We love to help! If you have ever used a conventional photo editing program for the simple tasks like resizing, rotating, cropping or adding a border to your pictures, you must have realized it's like using a cannon to shoot a fly. Click 2 Crop makes your life easier, as it is designed to let you browse your photo collection fast and let you edit your photographs easily. Whether it’s the family gathering photographs or the photographs from your last vacation, Click 2 Crop handles them all. 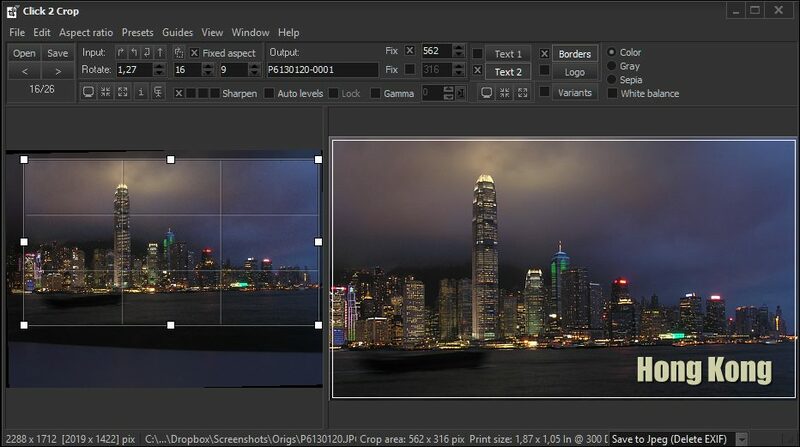 You can edit any photograph fast and easy using the simple, easy to understand and intuitive interface of Click 2 Crop. Photo Jumble uses a different approach to making collages. In Photo Jumble you can create collages with non-regular, randomly placed and rotated layers with different aspect ratios. TexToPix or Text-o-Pics are pictures made from text. This is also one piece of software that can create image effects that can not be made with conventional image editors. Unlike most of the existing ASCII-Art image programs, you are not limited to fixed-width font faces. Your Text Images can be drawn with any font installed on your system. You may create black and white, grayscale and even color images. Please see TexToPix Page for more information, picture examples and download links. BG_ASCII - interactive ASCII graphic tool. BG_ASCII is interactive ASCII graphic tool. It can create pictures made of ASCII characters and save it as black and white plain text files or color HTML pages. It can also do a gradient color text like this. A program has been reviewed and awarded by some freeware catalogs. 12 Apr 2019 - Mazaika for Mac v.2.4.3 Checked and notarized by Apple. 20 Dec 2018 - Mazaika for Mac Updated to version 2.4. Download the free trial version. 19 Dec 2018 - MAZAIKA for Windows v 4.3 has been released! Download the free trial version. 12 Dec 2018 - Mazaika-Animation for macOS updated to v 1.3.1 Download the free trial version. 29 May 2018 - Click 2 Crop for MS Windows updated to v.5.1. Add your own Custom Presets! 24 May 2018 - MAZAIKA for Windows updated to v 4.2.1 Download the free trial version. 11 May 2018 - Mazaika for Mac Updated to version 2.3. Download the free trial version. 28 Apr 2018 - MAZAIKA for Windows v 4.2 has been released! Download the free trial version. 23 Apr 2018 - TexToPix for MS Windows v 2.0 has been released! Download the free trial version. 21 Feb 2018 - Mazaika-Animation for MS Windows has been released! Download the free trial version. 07 Feb 2018 - Click 2 Crop for MS Windows updated to version 5.0.3. 25 Aug 2017 - Mazaika for Mac Updated to version 2.2. Re-designed statistic functions. 02 Aug 2017 - Mazaika-Animation for macOS updated to v 1.2. Download the free trial version. 19 Jul 2017 - Mazaika-Animation for macOS has been released! Download the free trial version. 28 Apr 2017 - MAZAIKA for Windows v 4.1 has been released! Download the free trial version. 29 Mar 2017 - An animated photographic mosaic for UMSL at MazaikaCom YouTube Channel. 23 Dec 2016 - Photo Jumble v 3.0 for MS Windows 32 or 64-bit application with the new interface! 08 Aug 2016 - See MAZAIKA v 4.0 for MS Windows video tutorial. 29 Jul 2016 - MAZAIKA v 4.0 for MS Windows 32 or 64-bit application with the new interface! 28 Apr 2016 - Click 2 Crop v 5.0 for MS Windows is released! Now both for 32 and 64-bit! 02 Dec 2015 - Merry Christmas video mosaic. 16 Nov 2015 - TexToPix for Mac OS X updated to v 2.0 Download the free trial version. 11 Oct 2015 - Mazaika-Video Updated to v1.1 Make Infinite Loop video mosaic easily. 11 Oct 2015 - Mazaika for Mac v.2.1.1 Updated for OS X El Capitan (10.11) compatibility. 11 Aug 2015 - Photo Jumble for Mac v.2.1. 05 Aug 2015 - Mazaika for Mac v.2.1 Support for Apple Photos app. 02 Jun 2015 - Click 2 Crop for Mac OS X updated to v.2.1. Run "Check for updates..."
28 Apr 2015 - New 3D animation mosaic example at MazaikaCom YouTube Channel. 31 Dec 2014 - Mazaika-Video for Mac OS X released!. Download the free trial version! 14 Oct 2014 - Few more video mosaics were made with Mazaika-Video. 09 Sep 2014 - How to install Interactive Mosaic on your web site. 31 Aug 2014 - MAZAIKA for Windows v.3.8 exports to zoomable interactive images! 17 Jul 2014 - Fritz Lang's Metropolis video mosaic. 14 Jul 2014 - Click 2 Crop for Mac OS X updated to version 2.0 Download the free trial version. 23 May 2014 - Mazaika for Mac v.2.0 Export to zoomable interactive web pages! 28 Apr 2014 - Photo Jumble for Mac was updated to v.2.0 Download the free trial version. 27 Apr 2014 - Searchable online photo mosaic Scars of Dracula! 20 Mar 2014 - Photo mosaic animation video Planet of Light! 28 Nov 2013 - Mazaika-Video - make a mosaic from your movie clips! 28 Mar 2013 - Mazaika for Mac was updated to v.1.6 Crop mosaic cells manually! 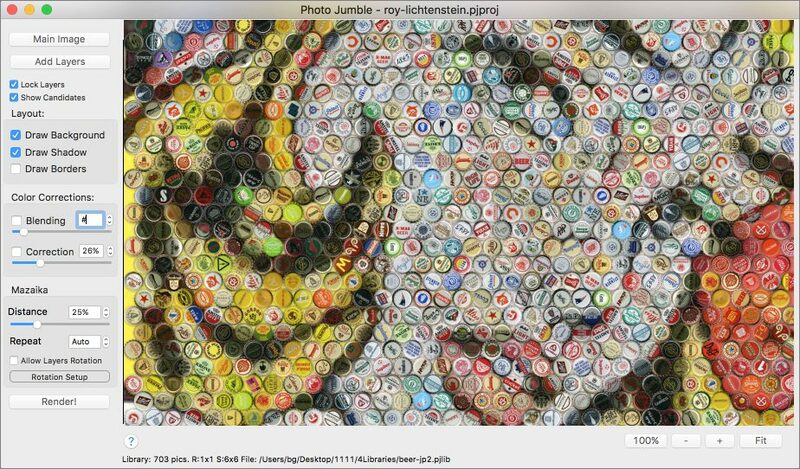 26 Feb 2013 - Photo Jumble for Mac OS X is released! Download the free trial version. 24 Oct 2012 - Largest Photo Mosaic In The World: 33 Gigapixel Photo Mosaic. 28 May 2012 - MAZAIKA for Windows v 3.7 has been released! Download the free trial version. 20 Dec 2010 - MAZAIKA v 3.5 has been released! Download the free trial version. 22 Nov 2010 - Mazaika for Mac OS X v 1.2 has been released! Download the free trial version. 12 Oct 2010 - Click 2 Crop for Mac OS X updated to version 1.4 Download the free trial version. 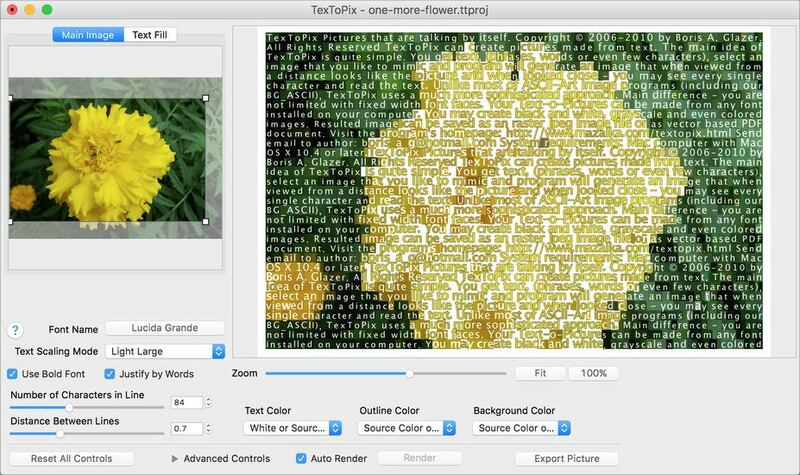 27 Aug 2010 - TexToPix for Mac OS X v 1.0 has been released! Download the free trial version. 17 May 2010 - Photo Jumble v 2.6 has been released! Download the free trial version. 17 May 2010 - We have added a short video tutorial for Photo Jumble. 16 May 2010 - We started a new site PhotoJumble.com for our Photo Jumble program. 28 Apr 2010 - MAZAIKA v 3.4 for MS Windows has been released! 02 Apr 2010 - Mazaika for Mac OS X v 1.1 has been released. 09 Feb 2010 - New Image Collection: 800 Flower Photos. 09 Feb 2010 - Let a thousand flowers bloom! Zoom and Pan Photo Mosaic. 02 Feb 2010 - Mazaika for Mac OS X is released! Download the free trial version. 19 Oct 2009 - Click 2 Crop v 4.8 is released! Download the free trial version. 12 Oct 2009 - Click 2 Crop for Mac OS X is released! Download the free trial version. 28 Apr 2009 - Photo Jumble v 2.5 has been released! Download the free trial version. 02 Apr 2009 - MAZAIKA v 3.3 has been released! Download the free trial version. 17 Nov 2008 - Photo Jumble: High-resolution Christmas postcard collage. 05 Nov 2008 - Click 2 Crop v 4.7 is released! Download the free trial version. 12 Sep 2008 - TexToPix v 1.0 has been released! Download the free trial version. 23 Jul 2008 - MAZAIKA v 3.2 has been released! Download the free trial version. 05 Jun 2008 - Photo Jumble v 2.1 has been released! Download the free trial version. 12 Nov 2007 - View Online Click 2 Crop Help pages. 09 Nov 2007 - Click 2 Crop v 4.5 is released! Download the free trial version. 09 Sep 2007 - Photo Jumble was used for Inflight Review magazine cover. 04 May 2007 - Photo Jumble v 1.0 has been released! Download the free trial version. 28 Apr 2007 - MAZAIKA v 3.1 has been released! Download the free trial version. 07 Dec 2006 - Photo Jumble See a preview of the new software in Mazaika line. 06 Oct 2006 - MAZAIKA v 3.0 new functions list, Download the free trial version. 07 Apr 2006 - MAZAIKA v 2.7 is released! Download the free trial version. 19 Jul 2005 - Click 2 Crop v 3.3 is released! Download the free trial version. 21 Jun 2004 - Example of High-Quality Zoom and Pan Photo Mosaic. 27 Nov 2003 - An aerospace selection of Xmas - New Year postcards. 24 Jul 2003 - World movie actors collection for download to use with Mazaika. 27 Aug 2002 - Mosaic poster of "The Shining" movie in the gallery. 15 Jul 2002 - 1000+ Christmas greeting cards tile image collection part 2 for Mazaika. 23 Feb 2002 - Amateur cats photo tiles collection (3000+ photos) to use with Mazaika. 06 Dec 2001 - Mosaic picture of Santa made of Xmas postcards in the gallery. 15 Nov 2001 - New Xmas, Santa, and New Year cards tile image collection for Mazaika. 16 Aug 2001 - Free beer bottle labels tile image collection for use with Mazaika. 28 Jun 2001 - Video cassette covers collection for download (950 covers) to use with Mazaika. 28 Apr 2001 - Picture of Uncle Sam made of old WWI posters in the gallery.